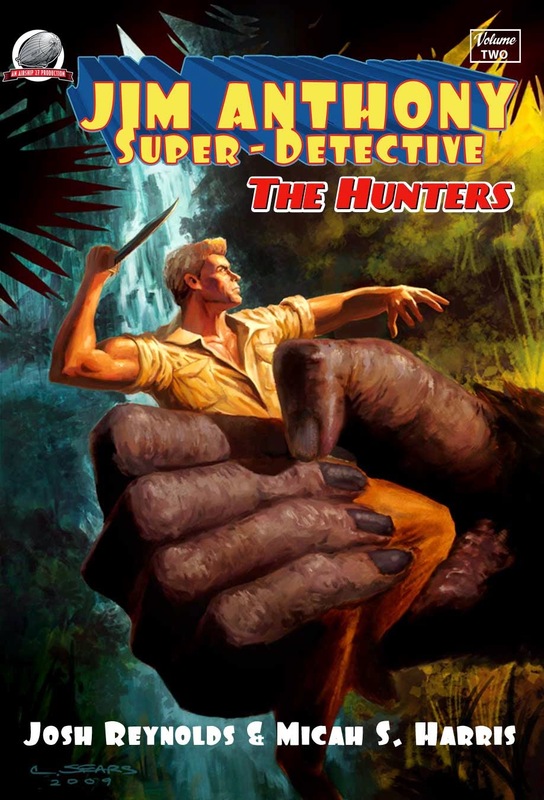 I am currently reading this novel featuring Jim Anthony (a hero from the "spicy" pulp Super Detective who was created as an imitation of Doc Savage, but has many qualities setting him apart from the Man of Bronze), which has him battling villains alongside Count Zaroff from Richard Connell's famous story "The Most Dangerous Game." The novel is split into two halves, each by a different author. Josh Reynolds' story is "Death in Yellow," which has Anthony and Zaroff fighting members of the Tcho-Tcho race of the Cthulhu Mythos, as well as tie-ins to Robert W. Chambers' The King in Yellow. Among other crossovers, Anthony first meets Zaroff at the New York branch of Jules Verne's Baltimore Gun Club, and Jim and a friend discuss a trip to Maple White Land with Ki-Gor (whose first published appearance in 1938 must have actually taken place years earlier, since The Hunters takes place in 1931.) Micah Harris' "On the Periphery of Legend" has Anthony and Zaroff hunting game on an island far west of Sumatra that is still inhabited by dinosaurs. While there, they encounter a film crew and a giant ape, who is later brought back to civilization. Again, there are crossovers besides the obvious connection to King Kong, such as the appearance of a former member of the Czar's inner circle who is using the name Allardravitch, who has a prominent nose and a ring, obviously a disguised version of a major pulp character. He may have begun his literary life as a Doc Savage clone but thanks to Josh Reynolds, Jim Anthony has become so much more. He's come out of that shadow of being a knockoff to develop into his own vibrant and unique character. Seems an odd team up to me since Zaroff was the villain in the original story.